Dr. Bisanga - scar repair using FUE. 5 months. 594 FUE into previous Strip scar that suffered from necrosis post op from a doctor in Spain. Dr Bisanga placed a low density to give growth the maximum chance and spread to achieve a coverage over the area. Pictures show pre BHR, placement and close up of growth at 5 months post op. Consultations are by appointment only; free of charge and obviously without obligation, the aims are to assess your donor capability against goals and desired technique via either FUE or FUT. What the hell is that? The pic to the right look s like tiny tumors growing out of his head. » out of his head. It’s probably just scabs fresh from the procedure. The picture must have been taken immediately after the procedure. Once they clean up the donor site it should look normal. Focus on what matters the most, ie: the result. Really good result for the numbers used. On the other hand it is a shame to see this kind of mutulations. This looks very very good, the only thing I would change is to use body hair instead of scalp hair. Why waste precious scalp hair for repair? » hair instead of scalp hair. Why waste precious scalp hair for repair? Thank you for your comments, this was a hard case for the patient after his previous experience. You bring up a good point and something the patient deliberated on for some time; this previous procedure did not only leave him with a large scar, and what you see was not the entire line just the worst area, he also had poor yield , pitting and plugs on his hair line. To say he was physically scarred was only the beginning, the mental trauma was maybe worse; it took him sometime to gain any trust again that anything positive could be achieved. When we discussed his options it was broken down into priorities, the scar to fill, his hair line, then a thinning crown. His laxity had been seriously impaired due to the first procedure so removing another strip was not going to yield a great amount of hair, especially as his density was approximately 70 anyway. FUE would have boosted the numbers up but on its own not enough to really address all the areas properly. Body hair was an option but with his previous bad experience he was not willing to go through another procedure and possibly see little for his efforts. 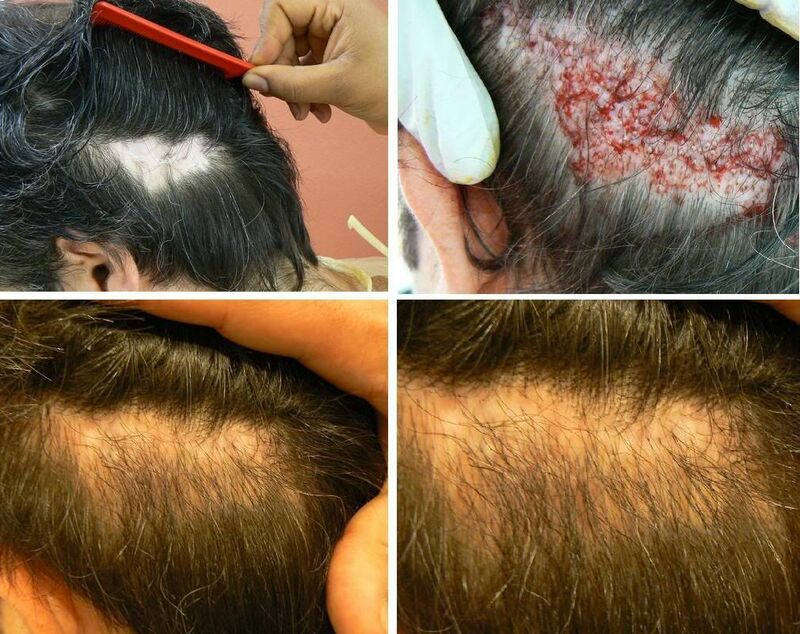 Initially he decided on the graft removal via FUE on his hair line, define it a little, and add hair to the crown and scar (both scalp hair 2400 grafts with FUE & FUT) and then a body hair test to measure the growth. Prior to the procedure he changed his mind and decided on the plug removal, scalp hair into the scar and a body hair test on his crown. At this stage he was more concerned with getting back to some normality rather than restoration. At 5 months when the post op picture was taken he already has good growth from the scalp hair, it has made a huge difference to him psychologically and he can expect more growth to come over the next 7 months or so. The plug removal on the hair line has restored a natural looking hair line and the body hair test at 5 months showed growth. At present he is less concerned about restoration and happy to be, well not “cured” but for him in a better situation than he had ever hoped. Whether he does further surgery is probably 50-50, and leaning towards no. I will try to post some pictures of the frontal area and the body hair test later. I too have a strip scar that needs to be fixed although mine is not nearly as bad as your patient. Some doctors have shown promising results using beard grafts to break up the scar, it seems to be the most robust among the diff types of body hairs. You should consider that as an option. » diff types of body hairs. You should consider that as an option. It was not so much a case of caution and more caution but the patient is mid 40’s and all he wanted was to be repaired, his initial wish of wanting to have more hair had been quashed by the first op. That is what is important about repairs, as I am sure you know well, it is so personal and your initial goals can change. He needed some degree of closure and not left waiting or wanting more. We have performed a few BH tests in the donor, as well as removing old plugs and placing back into the donor, especially in open donor cases. Dr B’s principle with any BH is test first, we perform this free of charge and then assess whether it it is worth proceeding. » » diff types of body hairs. You should consider that as an option. » left waiting or wanting more. » then assess whether it it is worth proceeding. » » » diff types of body hairs. You should consider that as an option. » » left waiting or wanting more. much better looking scar for such bad previous work. » » plugs and placing back into the donor, especially in open donor cases. » » then assess whether it it is worth proceeding. BHR, the fue is growing very nicely in the scar, I wonder if his scar is raised or is it flat? I can’t tell from a two dimensional photo. » raised or is it flat? I can’t tell from a two dimensional photo. It was quite flat, I’ll see if I have better pictures of the scar pre op, close ups and post them. Its his personal choice, so I guess we respect his decision. But its a pity that precious scalp hair was used when beard hair could have sufficed. » » raised or is it flat? I can’t tell from a two dimensional photo. » close ups and post them. » » » raised or is it flat? I can’t tell from a two dimensional photo. » » close ups and post them. That’s what I thought. I forgot who said that, flat scars have better chance of giving good yield. My scar is raised unfortunately, it has sort of a bump. That does not look like a stretched scar to me although I have seen this kind of situation described as a stretched scar several times. The problem as i see it is that there is hair in the center of the bald patch. If it was the scar that was stretched then this could not happen. 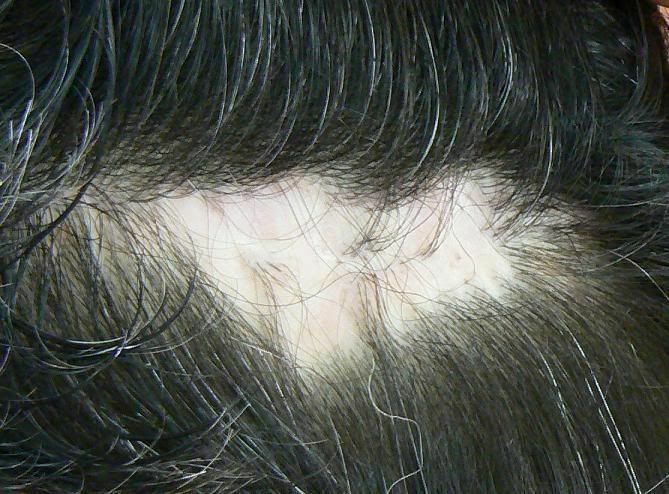 It seems likely that these kind of cases represent a tension alopecia. I think that this explains why these kind of cases respond well to transplants. » kind of situation described as a stretched scar several times. » that this explains why these kind of cases respond well to transplants. According to the patient it was not due to stretching but by an infection post op that caused necrosis, basically the dead skin spreading over a wider area. The other areas of his strip scar are relatively good.